Tobi Vail - ZineWiki - the history and culture of zines, independent media and the small press. Tobi Vail is a writer, musician and zinester. She was the editor of the Olympia, WA-based Jigsaw zine, which was originally published from 1989 until 1995, although there have recently been small previews of a newer, online-only issue #8 at Vail's record label website, Bumpidee. Tobi joined her first band at age fifteen. It was called The Go Team, and with band mate Calvin Johnson they two released a series of singles and cassette tapes on K Records featuring guest musicians such as Kurt Cobain, Billy Karren, Dave Nichols and zinesters Donna Dresch, David Nichols, and Jeffery Kennedy. After that, she performed with the all-girl band Doris. After that band ended, she co-founded and drummed in the band Bikini Kill which, along with the band Bratmobile, introduced Riot Grrrl to the world. During this period, she also wrote for the band's fanzine of the same name. 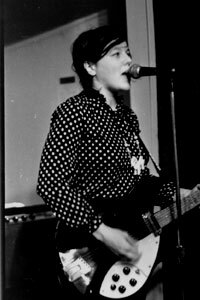 Vail may have coined the term "riot grrrl", something she later claimed in a later issue of Jigsaw was a joke not to be taken seriously, as the media and everyone else has then and since. She is currently in the band Spider and the Webs.